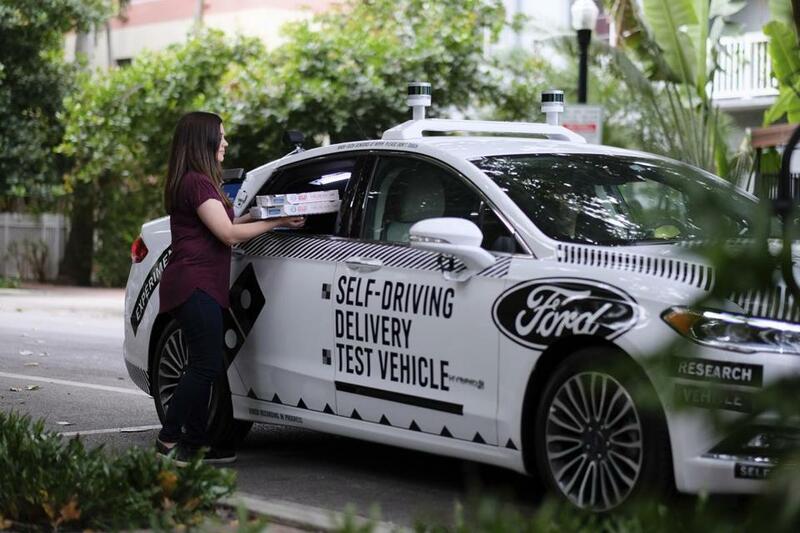 A self-driving vehicle from Ford and partner Domino&apos;s Pizza, in Miami, Fla.
New York’s recent adoption of a congestion-pricing system in Manhattan is renewing attention to urban traffic woes. The conversation should include the impact of self-driving cars. A number of studies, including one from 2018 by the World Economic Forum and the Boston Consulting Group, have found that self-driving cars may increase traffic congestion, especially in cities. One potential solution is to use shared autonomous vehicles to connect people to public transit. Trains are typically the most efficient way to move large numbers of people around cities, provided the trains are full. Small driverless shuttle buses that transport people between their neighborhoods and the nearest trains and subways would support rather than compete with existing urban infrastructure. These autonomous shuttles, which would run on electricity and seat 15 people or fewer, would help fill the system’s gaps more affordably than conventional buses could. Two startups — May Mobility, which is based in Ann Arbor, Mich., and Optimus Ride, based in Boston — are attempting this already, right here in the Northeast. Like Alphabet’s Waymo, Ford’s subsidiary Argo, and GM’s Cruise, they build self-driving systems for vehicles. However, their vehicles, which resemble souped-up golf carts, operate only in limited areas, usually at no faster than 25 miles per hour. In industry speak, they have “level 4” automation, which means they are capable of driving themselves under certain conditions, not “level 5”, which would mean they are fully autonomous. It’s a deliberate trade-off. Embracing such limits lets these startups get on the road and make money now while figuring out how to navigate more complicated environments. It’s also a business model geared toward integrating with public transit. Instead of marketing to individual consumers, the startups operate fleets of vehicles for clients ranging from city governments to real estate developers. And those clients often want the vehicles to connect to transit hubs. That’s one of the ideas behind the upcoming launch of May Mobility’s five-passenger shuttles in Providence. The Rhode Island Department of Transportation is hiring the startup to ferry people between the artsy neighborhood of Olneyville Square and Providence Station. The route, which runs along the Woonasquatucket River corridor, currently lacks public transit. In South Weymouth, Optimus Ride takes people to and from the local train station as part of a deal with a real estate developer. Residents of the mixed-use development Union Point book rides using a special mobile app and can choose between several routes. The startup says 75 percent of the thousands of trips it has completed since May 2018 begin or end at the commuter rail station located about a mile from Union Point. This summer, Optimus Ride will start facilitating commutes in New York when it begins shuttling workers to the NYC Ferry through the Brooklyn Navy Yard. The MIT spin-off says the partnership, with the Brooklyn Navy Yard Development Corporation, will serve local residents as well as employees of the industrial park. In these early days, it’s difficult to quantify the impact of autonomous shuttles providing first and last-mile travel throughout a city. McKinsey says their adoption could help reduce average time per trip by 10 percent and prices per trip by 25 to 35 percent if cities also make supporting changes, such as “effective regulation and incentives” that promote shuttle use over private cars. Though experts don’t expect cars to be fully autonomous until 2030, we need to think about their implications now. Most cities didn’t do this type of planning during the 20th-century automobile age and later grappled with health and environmental problems due to urban sprawl. If we start formulating policies today, we can shape our autonomous future in a way that maximizes benefits for both cities and residents.